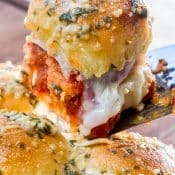 These Chicken Parmesan Sliders turn chicken nuggets into cheesy, garlic-y chicken parmesan mini Hawaiian sandwiches that are perfect appetizers for a snack, potluck or game-day party. Sliders, of any kind, made using Hawaiian rolls or soft dinner rolls, are always perfect for a party, potluck or tailgating game day function. 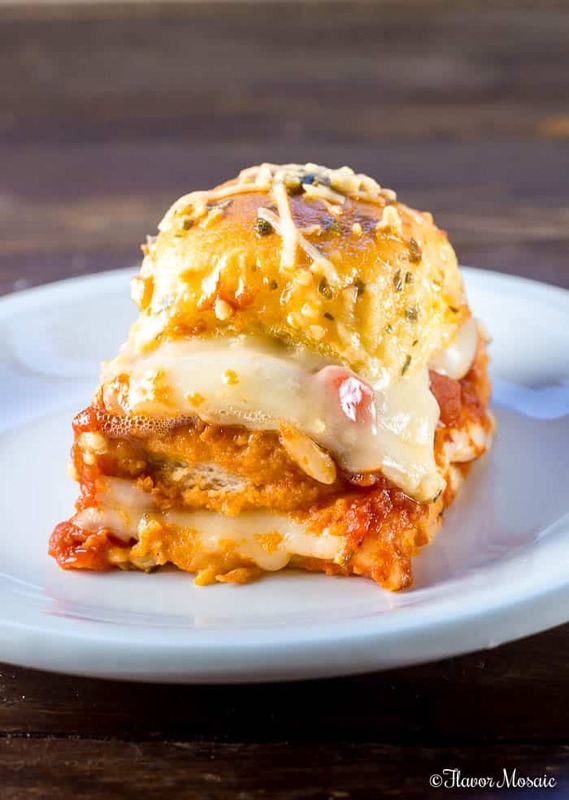 For example, like my Ham and Swiss Sliders, or my Turkey Cranberry Sliders, these Chicken Parmesan Sliders are made using Hawaiian rolls but add chicken nuggets, spaghetti sauce or pasta sauce and mozzarella cheese for a baked Italian style slider that was served at our Super Bowl party. 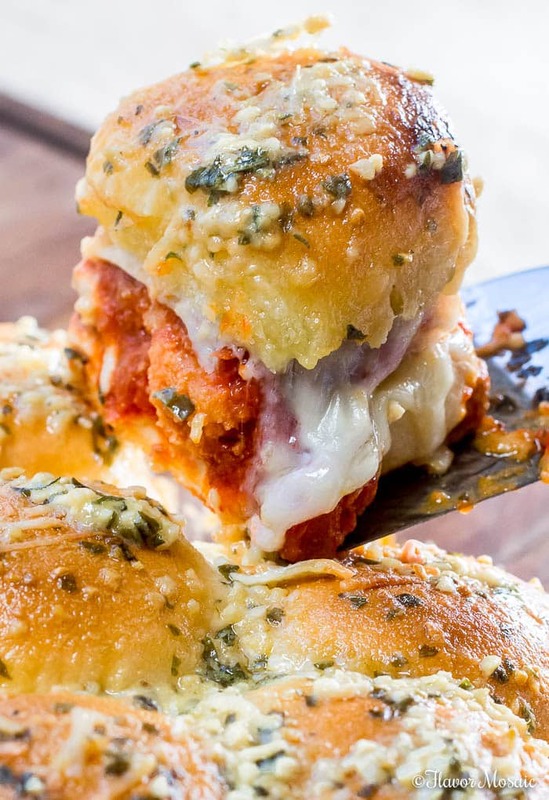 With only a few simple ingredients that you most likely already have on hand, you can make these delicious Chicken Parmesan Sliders. After you have all your ingredients then you need to start layering the ingredients for the sandwiches or sliders. DO NOT PUT FROZEN CHICKEN NUGGETS ON THE SLIDERS!! Heat the chicken nuggets per the package directions first! Then set them aside until you are ready to assemble the sliders. Slice the rolls in half horizontally. 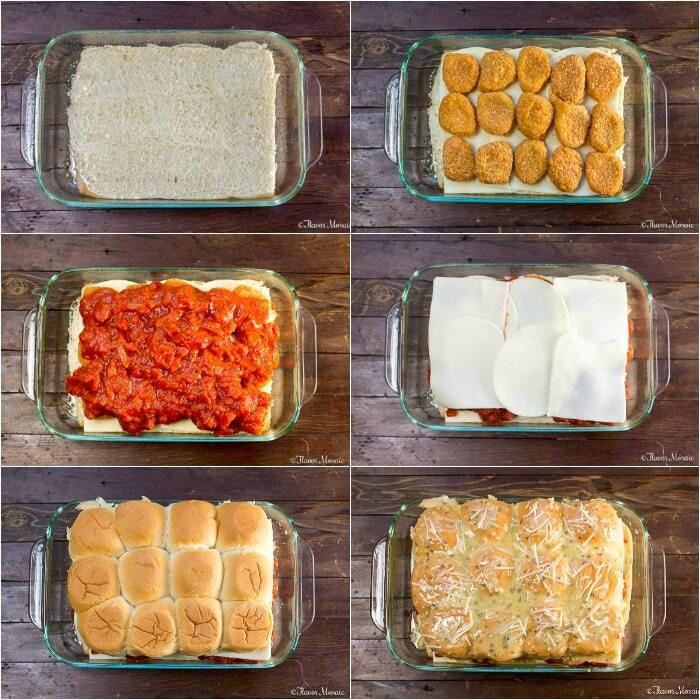 Place the bottom half of the rolls in the bottom of a baking dish. Place 15 heated chicken nuggets on top of the rolls. Pour the pasta sauce or spaghetti sauce on top of the chicken nuggets. 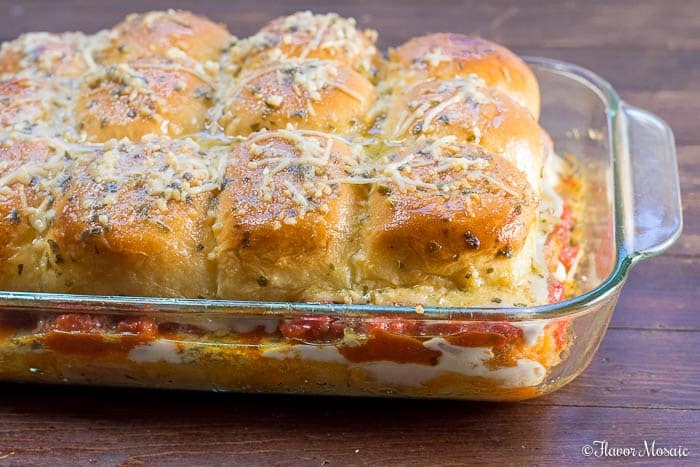 Layer slices of Mozzarella cheese on top of the sauce. 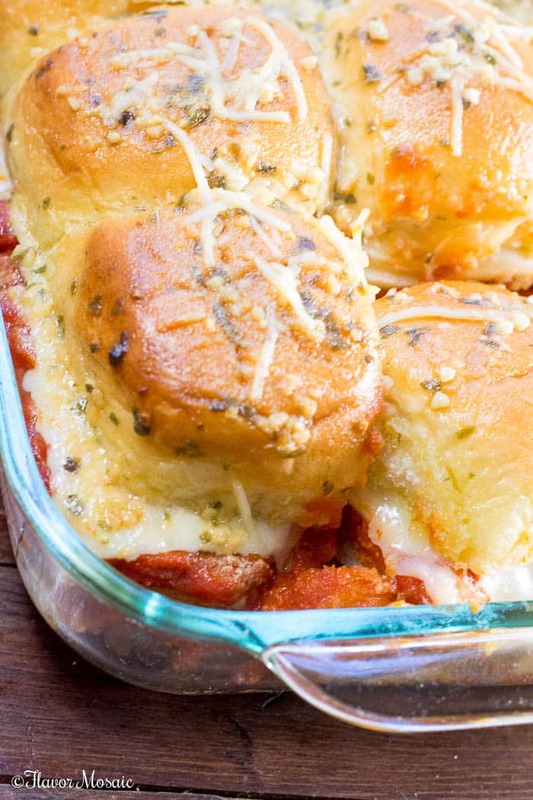 Place the top half of the Hawaiian rolls over the cheese. After making the sliders, make the Garlic Dijon Butter Sauce and pour over the top of the Sliders. Don’t skip this step because it adds such tremendous flavor! To make the Garlic Dijon Butter Sauce, stir together melted butter, minced garlic, Dijon mustard, dried basil, and Worcestershire. Then pour the butter sauce over the top of the sliders. If you like, sprinkle come shredded parmesan cheese on top. After the sliders are in the pan and ready to bake, cover the pan with foil and bake the Chicken Parmesan Sliders in a preheated oven at 350 degrees for 20 minutes and remove the foil and bake another 5 minutes or until the tops are golden brown, the cheese is melted and the sliders are heated through. When the tops are golden brown and the cheese is melted then remove the sliders from the oven and serve hot! Yum! Serve these for afternoon snacks, a potluck, party, game day or a holiday party. Go ahead and give these a try and come back and let me know how you liked them by leaving a comment below. Preheat oven to 350 degrees F. Spray a baking dish with cooking spray. Heat the chicken nuggets per the package instructions. (DO NOT put frozen chicken nuggets on the sliders.) Remove the chicken nuggets from the oven and set aside until you are ready to assemble the sliders. Place the bottom half of the rolls in the baking dish, cut side up. Lay the chicken nuggets over the bottom half of the rolls. Pour the spaghetti or pasta sauce over the chicken nuggets. Place the top half of the rolls (cut side down) on top of the cheese slices. 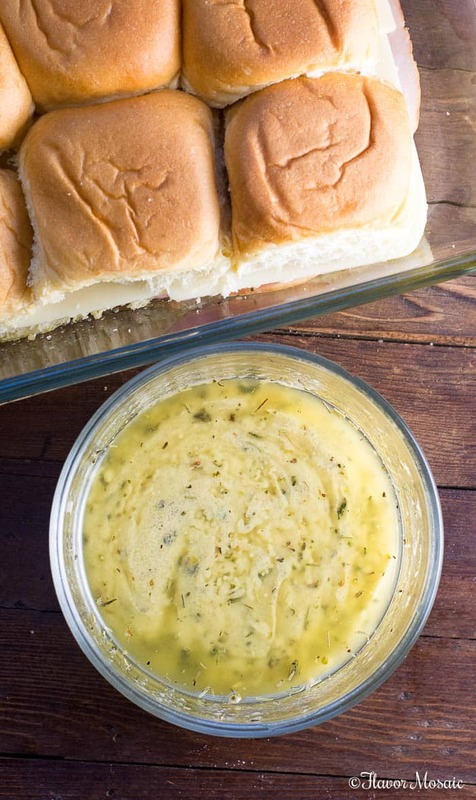 Pour the Italian Garlic Dijon Butter Sauce (See recipe below) over the top of the rolls. If desired, sprinkle with shredded parmesan cheese on top of the sliders. Cover the baking dish with foil. Bake in a preheated oven for 20 minutes. Remove the foil and bake for another 5 minutes or until the sliders are golden brown on top and the cheese is melted. In a small bowl, stir together the melted butter, minced garlic, Dijon Mustard, Worcestershire, and dried basil. Heat the chicken nuggets per the package directions before placing them on the sliders. DO NOT put FROZEN chicken nuggets on the sandwiches. 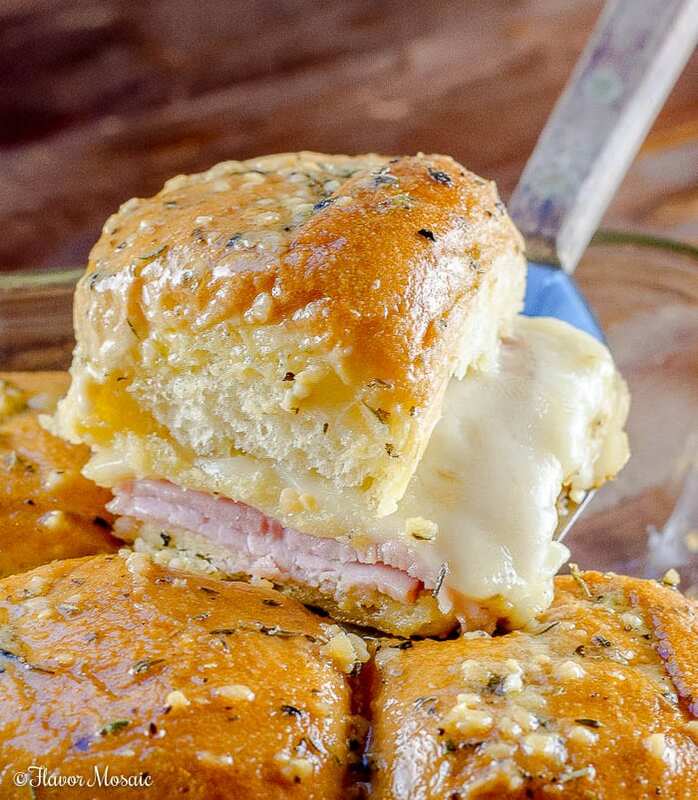 If you like this recipe, be sure to check out these Ham and Swiss Sliders! Umm…..yum. I’m drooling over these beauties! They taste better even than they look! 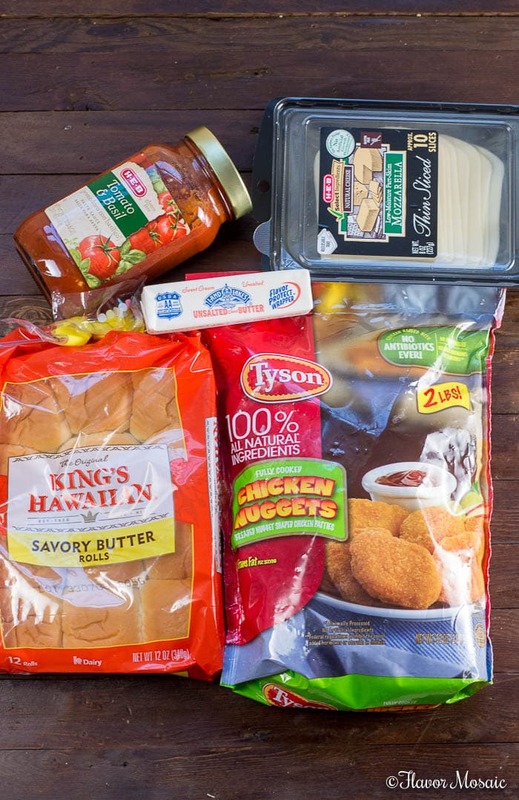 Silly question- do you use frozen chicken nuggets that are fully cooked prior to freezing or do you precook the nuggets before assembling sliders? Hi Danielle, I precooked the frozen chicken nuggets. Don’t feel bad, I was wondering the same thing. Hopefully someone will help us out soon. Hi Laura, I precooked the chicken nuggets.